If you start off your morning with a mug of coffee, you may want to swap it out for a cup of tea, instead. Research has found that tea – especially green tea – offers a variety of dental health benefits. You may significantly boost your oral health with this simple lifestyle change. 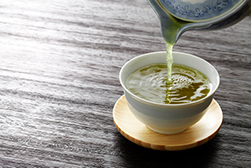 Drinking green tea regularly can lead to major benefits when it comes to cavity control. Green tea has been shown to lower the acidity of saliva and plaque, and it also helps to control bacteria levels. These benefits will all help to prevent cavities and decay. Green tea also protects gum disease. Besides reducing oral bacteria levels, green tea also contains anti-inflammatory properties that will help to control periodontal disease. There are many ways that green tea can help with your breath. Most importantly, it kills off the bacteria that cause stinky halitosis. In fact, some studies have shown that green tea is more effective at preventing bad breath than chewing gum and mints. With reduced risks of gum disease and cavities, drinking tea regularly can actually help you to retain your natural teeth for as long as possible. Researchers have found that people who drink at least one cup of tea per day were more likely to retain their natural teeth than people who do not drink tea regularly. Green tea is packed full of antioxidants that can protect against cancerous tumor growth and other cellular damage. Other studies have found that green tea can slow the progression of oral cancer. While green tea can certainly improve your oral health, you still need to see your dentist even if you drink it regularly. Give us a call today to set up your next appointment.